The Chromebook has quickly moved into prominent discussions among educators as a flexible Internet-based device in classrooms. 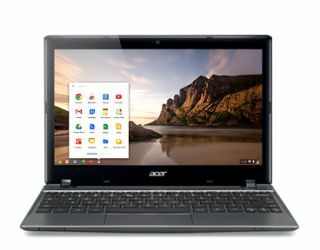 Whether you are using the system as a cart or taking advantage of 10-second start-up times or optimizing it as a low-cost 1:1 device for utilizing Google Apps, the Chromebook is now a computer that schools must consider. Over the past year, several manufacturers have come into the marketplace, including Samsung, Acer, Lenovo, and HP. Since Chromebook’s operating system is the same across all of these platforms, we thought it would be interesting to take each model for a test drive and look at what makes them unique. Today we look at the Samsung Chromebook. Next up - the Lenovo x131e. The Samsung Chromebook is lightweight, fast enough for most tasks, and a perfect combination of price and features. In most instances, it runs quickly; however, it can get bogged down with 20+ open tabs or in very large Google Spreadsheets. The 5 out of 5 "coolness factor" rating is for its size and look. The battery life is excellent for a school setting and the keyboard and mouse are comfortable to use. All ports except SD are in the back. Durability:Holds up well under tests. Screens and small power plug are the most common issues. Size: 11.40" x 8.09" x 0.69"